I love a good simple meal, especially one where half the work is already done. When I make Roasted Eggplant Dip, I make extra, so I can use it in this garden fresh pasta. All you have to do is roast some cherry tomatoes, boil the pasta and add the leftover dip. Small effort for a fast and yummy vegetarian and vegan meal. Add a big salad to complete the picture. Cherry tomatoes are probably still in your fall garden, but if not, they are the one tomato that packs some flavor from the grocery store. 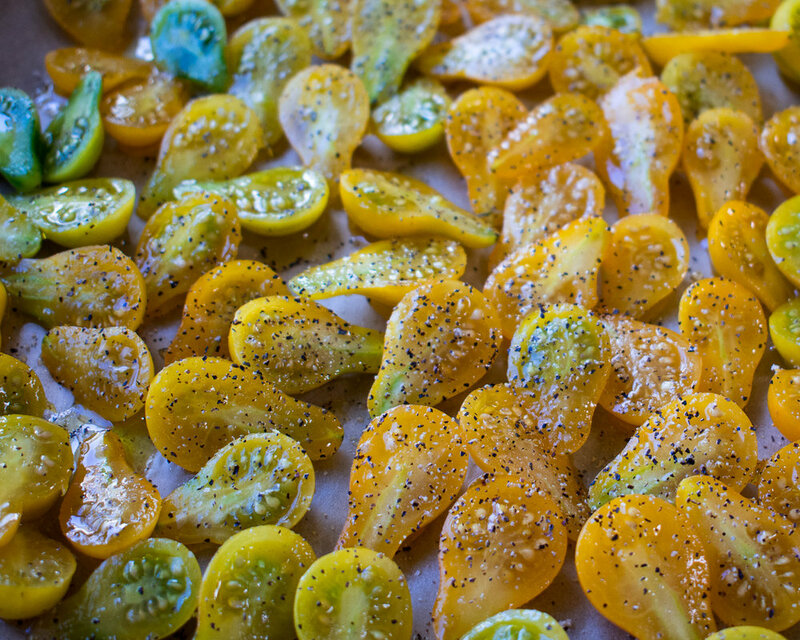 Roasting these little gems with some good olive oil turns them into a savory candy. Roasted cherry tomatoes and eggplant are a perfect flavor combination. I used yellow pear tomatoes here but any of the small varieties work. Start by roasting the cherry tomatoes. Preheat oven to 325 degrees. Cover a baking sheet with parchment paper. Half cherry tomatoes, filling the baking sheet with a single layer. Generously drizzle on olive oil. Season with salt and pepper to taste. Roast for 1 hour. Make herbed panko bread crumbs by heating olive oil in a medium hot skillet. Toss panko into olive oil and stir around for a couple of minutes. Remove from heat and stir in minced rosemary leaves and salt and pepper to taste. Set aside. When tomatoes are almost ready prepare the pasta. When the tomatoes and the pasta are done, you are ready for the assembly. Put the roasted eggplant dip in the bottom of a big bowl. Scoop out your pasta and put it on top of the eggplant, letting some of the pasta water drip into the bowl. Scrap the roasted tomatoes and all their juice and oil on top of the pasta. Stir together. Garnish with a good sprinkling of za’atar, toasted pine nuts and the herby panko. NOTES: If you don’t have time to make your own Roasted Eggplant Dip, you can buy a container of Babaganoush. It works too!